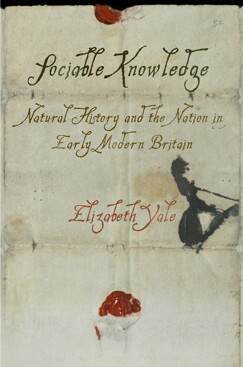 The University of Pennsylvania Press has just released Sociable Knowledge: Natural History and the Nation in Early Modern Britain by Adjunct Assistant Professor Beth Yale. Synthesizing book history and the history of ideas, Sociable Knowledge details the way that naturalists used technologies of writing to share and archive repositories of information. Alert to an array of kinds of communication—oral, written, and printed—Sociable Knowledge explains how the material practices of text-making redefined scientific insight and intelligence. More information can be found here. Congratulations Beth!